Dr. Edward Moore is also Curator for the Culture Collection University Gothenburg (CCUG) at the Department of Clinical Bacteriology, Sahlgrenska University Hospital. More information. Dr. Moore has participated in a major India related Sida funded research programme run by Göteborg University focusing on microbiological aspects related to the development of antibiotic-resistance in the environment around a pharmaceutical company in Hyderabad, South India. The project was entitled ”Microbial Diversity and Development of Antibiotic Resistance Associated with Industrial Wastewater Treatment” and was an outgrowth of the work started by Dr. Joakim Larsson and his research team from the Endocrinology Division, Dept. of Physiology, Sahlgrenska Academy at Göteborg University, some years earlier. The project also involved the research group of Professor Malte Hermansson at the Dept. of Plant and Environmental Sciences, University of Gothenburg. The collaboration partner on the Indian side was Dr. Yogesh S. Shouche, Principal Investigator at the Microbial Culture Collection (DBT), National Centre for Cell Science (NCCS), Pune University Campus at Ganeshkhind in Pune, Maharashtra. In November 2008, the project was given SEK 750 000 as a three-years research grant for the period 2009–11 from the Swedish Research Links programme (funded by Sida and the Swedish research Council). More information on the Swedish Research Links grants 2008. Project abstract: The increasing occurrence of antibiotic resistance (ABR) in strains of bacteria that are normally susceptible (ABS) to treatment has been a well-documented result of the indiscriminate use of antibiotics in medical treatment, as well as increasing use for agriculture and livestock. The ability of bacteria to exchange genes across species boundaries is an important factor in the spread of ABR. “Mobile genetic elements” (MGEs) carry the ABR genes that enable spread and development of multi-resistance in other bacteria. Mutation and acquisition of resistance genes through the transfer of genetic material between bacterial strains has enabled new strains of resistant bacteria to emerge as significant health concerns. Environmental antibiotic contamination can select for a widespread pool of resistance factors that can be transferred into human and animal pathogens, contributing to the selection of multi-resistant variants. The impacts of drugs, as environmental pollutants, the creation of new pools of resistance, together with incidences of genetic transfer across species, have not been adequately assessed. Moreover, antibiotics have the potential to exert perturbations on natural microbial communities and impact the natural microbial diversity and community function, thus, significantly influencing the functional health and stability of ecosystems. 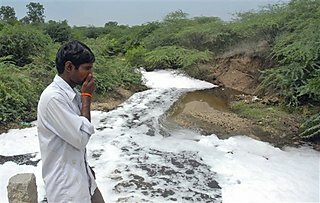 We have analysed the effluent from a common waste treatment plant (PETL) in Patancheru near Hyderabad, India, receiving and treating waste water from 90 different bulk drug producers. The levels of antibiotics found were as high as 1,000,000 times higher than those normally found in treated sewage effluents. The levels of ciprofloxacin were higher than those found in the blood of patients taking this drug. The amount released per day from this one site (45 kgs) corresponded to the entire use of ciprofloxacin in Sweden over an average 5 day period. Such levels will insure a significant impact on the natural microbial diversity, in turn, impacting geo-chemical processes and the influence of human pathogens. This is a multi-disciplinary project, employing methods of microbiology, molecular biology, chemistry toxicology and bioinformatics. We propose to analyse the impact of extreme, high levels of antibiotic pollution from production sites on microbial diversity, microbial community dynamics and the development of antibiotic resistance in the recipients. The application of recently developed methods in molecular biology are necessary in order to comprehensively address the extent of microbiological diversity, as well as the complexity of genes associated with antibiotic resistance. We propose to: 1) assess the impact of extremely high levels of antibiotic pollution on bacterial populations, i.e., diversity, species distribution and richness, using new cultivation-dependent and cultivation-independent approaches; 2) quantify the effect of antibiotic pollution from waste water treatment plants on the emergence and spread of bacterial pathogens; 3) characterise the increase in antibiotic resistance in bacterial populations, particularly in potential pathogens; 4) determine and quantify the prevalence of antibiotic resistance genes and the modes of transfer and acquisition of antibiotic resistance between bacterial strains and species; 5) demonstrate the impact of extremely high levels of antibiotic waste on the rat gut microbiota, i.e., with respect to diversity and acquisition of antibiotic resistance. The Indian PhD student Nachiket P. Marathe from Pune worked at Gothenburg University from October 25, 2010 until January 25, 2011, as part of this project between Gothenburg University and the National Centre for Cell Science in Pune, India. Nachiket has obtained an extensive collection of bacterial isolates from sampling sites affected by the waste-treatment facility and has carried out initial physiological and genotypic characterizations within the group of Dr. Shouche. With Prof. Moore’s group, Nachiket worked to further characterize the bacterial strains, for their antibiotic resistance profiles and other phenotypic, as well as genotypic traits. The initial analyses indicated that bacterial isolates exhibit marked increased resistance to a range of antibiotics. These studies included planned assessments of the levels of antibiotics in drinking water in villages in the vicinity of the waste-treatment facility. Nachiket P Marathe has returned to University of Gothenburg, now 2015 working as a post-doc in the research group led by Professor Joakim Larsson. This time he has come to Sweden due to a Sida funded collaboation between Pune and Gothenburg. Two researchers at the Dept. of Clinical Bacteriology, Prof. Stefan Lange and Dr. Ivar Lönnroth, have been involved in a major research project on diarrhoeal diseases among children in Lahore, Pakistan. The project, supported by a Sida/SAREC grant, was led by Prof. Lars-Åke Hansson at the Department of Clinical Immunology, and Prof. Shakila Zaman from the Health Services Academy in Islamabad. It also involved Dr. Javaria Mannan, Dept. of Social and Preventive Paediatrics, Fatima Jinnah Medical College in Lahore. The project was entitled ”Studying nutrient-gene interaction, influencing effects of malnutrition-infections on postnatal growth in children born in a slum in Lahore 1964-78”, and was carried out in 2005, and also a follow-up study of earlier research in Pakistan. It focused on means to prevent diarrhoeal diseases, still remaining a predominant problem in children living in less privileged populations. In 2007, the results were published as an article in the peer-reviewed magazine Acta Pædiatrica. The article was entitled ”B 221, a medical food containing antisecretory factor reduces child diarrhoea: a placebo controlled trial”. It shows that feeding with egg yolk powder (B221), containing antisecretory factor (AF) rich egg yolk gives positive results. Read the full article.